The Sandman Chronicles: Architecture Workshop in Athens! The very first Architecture Workshop, titled (what else?) "1st Athens Architecture Workshop", will take place in Athens, with the initiative of architect Nikos Ktenas and the invaluable participation of Vassilios P. Bartzokas, with Carteco as a sponsor and Brainlab as support. The whole thing is under the aegis of the Municipality of Athens. This international architecture workshop will take place from the 21st of July until the 2nd of August, in Athens. 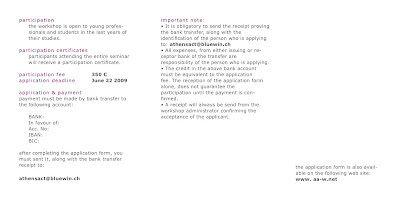 It is aimed at foreign and Greek students of Architecture as well as young architects working abroad. Prominent personalities of European Architecture will be teaching : Aires Mateus, Piere Allain Croset, Antonio Tejedor, Μichel Kagan, Nikos Ktenas and others. During the workshop, lectures open to the public will be given by João Luís Carrilho da Graça (Lisbon), Antonio Citterio (Milan), Aurelio Galfetti (Lugano), Franco Purini (Rome), while an exhibition of the projects will be organized and a special catalogue published. 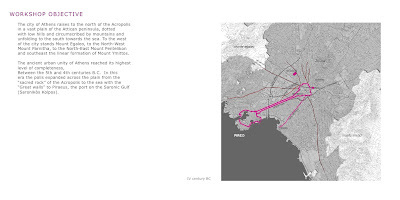 The aim is to give the possibility, through a detached view of prominent architects but of young architects too, to form architectural proposals for particular areas within Athens. Seven locations in the city centre have been chosen for this reason. These locations gather endogenously as well as between them a variety of disparate characteristics, and are spotlighted as study areas so that they can acquire a contemporary identity that will highlight their particularity and character. 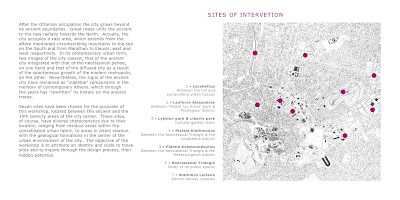 This undertaking is a challenge to all, participants and teachers as well as citizens of Athens (who will be able to be the recipients of this projects results - an alternative look on their city's public space reality), as a research on one of the oldest cities of Europe, with its particularity of historical, geographical and cultural elements. 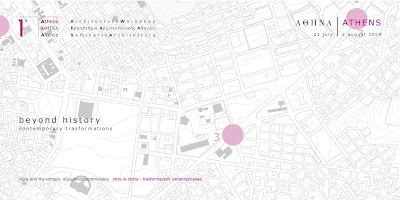 In other words, this architecture workshop places contemporary Athens in the place of a city whose public space has to be confronted henceforth with an architectural conscience and sensibility from all, beginning mainly from an academic research level that expects to be extended as a collective conscience.